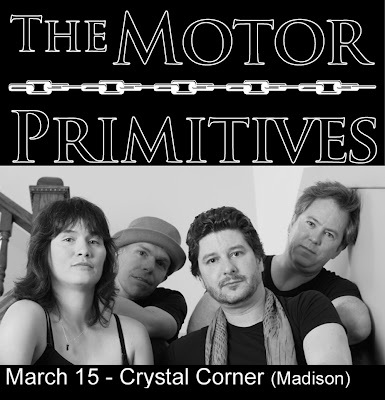 The Motor Primitives are playing at The Crystal Corner Bar (1302 Williamson, Madison, WI 53703) tomorrow night, March 15, 2008 (the ides of March!) Opening the show will be The Sigourney Weavers followed by Goat Radio. The MPs will play last (that's supposed to be good. Ha!) It all starts at 10:00 pm, so we probably won't hit the stage until midnight or so. Naps help. We were mentioned in this week's "picks" section in local paper "the Isthmus" even though Pam sent that irate letter to them written on a used popcorn bag (if you follow the link, it's the fifth letter from the top of the page. The second letter from the top of the page is by someone you might recognize, too.) I figured that would be the end of any coverage from the Isthmus. I guess you never know. After reading that letter I can safely say I love Pam. What goes up, must come down, right?